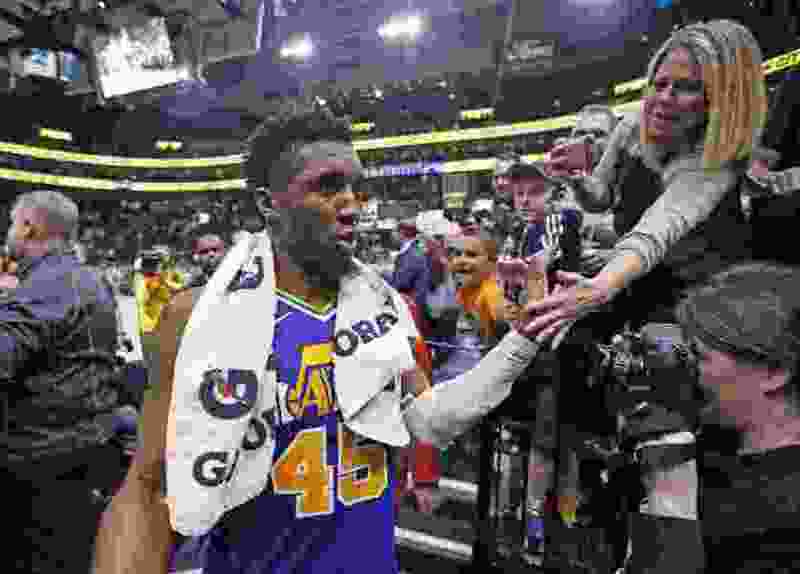 As the clock was about to strike midnight in Toronto, Donovan Mitchell made a new year’s resolution of sorts. “New year, new me,” he tweeted. That’s not to say Mitchell had a bad 2018, by any standard: He burst onto the scene with a dunk contest win, a playoff series win against Oklahoma City, and a signature shoe deal that put him in rarefied air among the NBA’s elite. But as he’s rounded the corner into 2019, Mitchell has regained that elite form that eluded him for the first couple of months of the season. Since that tweet, Mitchell is averaging 27 points and 5.1 assists per game, and he’s shooting 46.2 percent from 3. If he kept those stats up for the remainder of January, all three would set new career highs for a month. This homestand has been the best three-game stretch of his career statistically. Besides scoring over 30 points per game in each contest (33 each against the Magic and Lakers, and 34 against the Bulls on Saturday night), he’s also finding his teammates, averaging 7.3 assists per contest as he’s needed to take on point guard duties in the wake of injuries to Ricky Rubio, Dante Exum, and Raul Neto. It’s that passing that’s perhaps impressed most, right as the Jazz have needed it. Mitchell says he’s done “heavy” film study since Christmas, and what he’s started focus on is less about where he can get his open shots, but where his teammates have open opportunities when he drives. That’s resulted in some spectacular passes, even as Mitchell goes full bore to the rim. Look at this one, for example: It’s in transition, and Mitchell is sprinting at the Bulls defense. He looks to be stopped, though, so the logical kickout is to Royce O’Neale in the corner. But as the Bulls anticipate that pass, he somehow kicks it backward to Kyle Korver behind him, even though his momentum is taking him in the opposite direction. Korver even seems surprised by the ball coming in his direction. Not only have his assists been up, but his potential assists — passes that lead directly to a shot, regardless of whether it’s made or missed — have been up, too. He ranks fourth in the league in that category over the last three games, behind only Russell Westbrook, Ben Simmons, and James Harden. In other words, it’s not just that he’s getting lucky with his teammates making shots, he’s also setting them up often too. But maybe the biggest turnaround in his game has been the 3-point shot, which he’s made 24 of the 52 attempts he’s had in January. He says it’s all about taking better shots. But now, Mitchell says he’s “taking better threes." He’s using screens more often to make space for himself, then taking advantage of that space with a straight up-and-down shot form. This one is even a step-back, but you wouldn’t know it based on how vertically Mitchell jumps while taking the shot. It’s a little too soon to declare Mitchell is back, or better than ever. He’s put up solid performances, yes, but it’s been against the Orlandos, Detroits, and Chicagos of the world, and the Lakers without LeBron James available don’t scare anybody. His two worst shooting performances of January have been against the two best teams the Jazz have played: the Toronto Raptors and the Milwaukee Bucks. But maybe that’s exactly what the doctor ordered, some of the league’s weaklings to figure himself out against. Whether it be opponent strength, a new role at point guard, or simply the turn of the calendar, Mitchell has played his best basketball of the season in recent weeks, just as the Jazz have asked the most of him. Tipoff • Monday, 7:00 p.m.
About the Jazz • Ricky Rubio (right hamstring), Thabo Sefolosha (right hamstring), Dante Exum (left ankle sprain), Raul Neto (groin) and Tony Bradley (knee surgery) all are expected to be out for Friday’s game. … Grayson Allen returned to action on Saturday, playing 13 minutes and scoring seven points in his first Jazz game since December 12. … Vivint Smart Home Arena has sold out every game this season. About the Pistons • Henry Ellenson is out for the game due to an ankle injury, while Zaza Pachulia is doubtful after missing Saturday’s game against the Clippers. Ish Smith also missed Saturday’s game but is considered probable. … Blake Griffin scored 44 points in a matchup against his former club Saturday. … Pistons are 5-16 in their last 21 games.